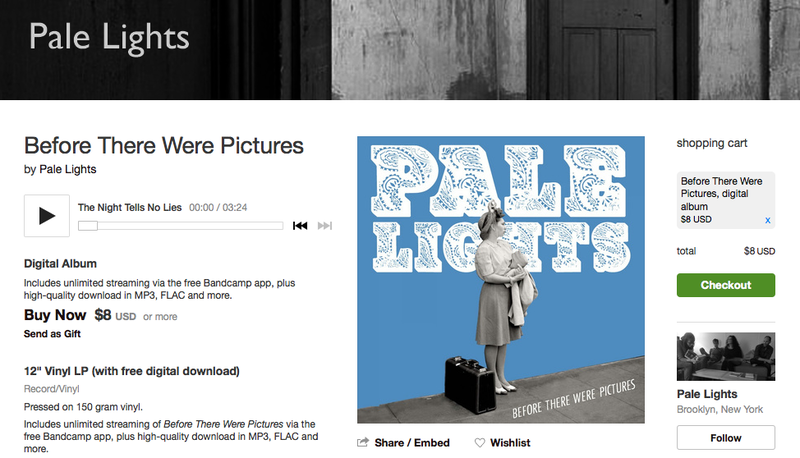 This past weekend, I wanted to buy the latest album by Pale Lights, a band from NYC (also recommended by The Big Takeover magazine). Directly from the band’s Facebook page, I linked to Pale Lights’ Bandcamp site from which I was able to quickly find the album. On the album details screen, I clicked the large Buy Now link. From the subsequent modal, I named my price (in the conveniently highlighted field) and could either checkout or add to my cart (by way of large, uniquely-colored buttons). I decided to add to my cart, the modal closed and a cart area appeared on the right column of the page - with a nice animation pushing some of the content down a bit. From there, the checkout modal guided me to Paypal and the rest was easy. It gets better when you buy two albums (from different artists). First off, you must go thru the checkout process multiple times (I assume so the money gets in the right hands) - one for the first artist and another for the second. And you’d expect that after the first purchase, you’d probably have to get your bearings, navigate back to the cart and start over with the second one. 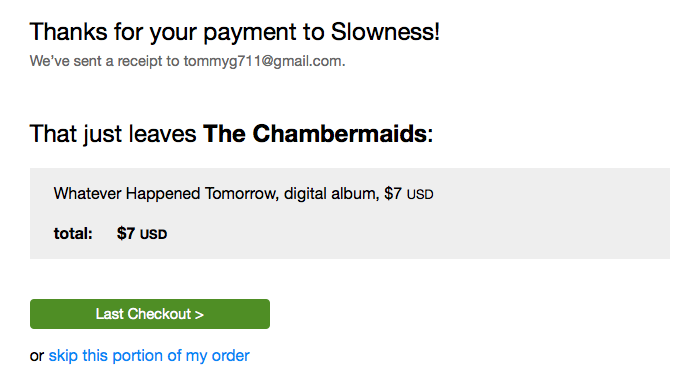 That didn’t happen at all - after the first purchase, I was happy to get a confirmation, an option to download it AND a Last Checkout button to begin the final purchase. What could have been a painful experience resulted in a good one where the app guided me along the way through multiple steps.